The Farmstead of Numedal; extends from the Hardanger plateau down to the town of Kongsberg. The loft has a gallery on three sides on the upper floor and is decorated with carved floral motifs. Farmhouse from Hallingdal – 1750. 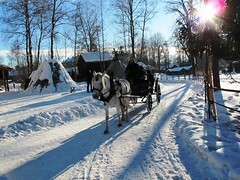 How about horse &carriage rides through the open-air museum? 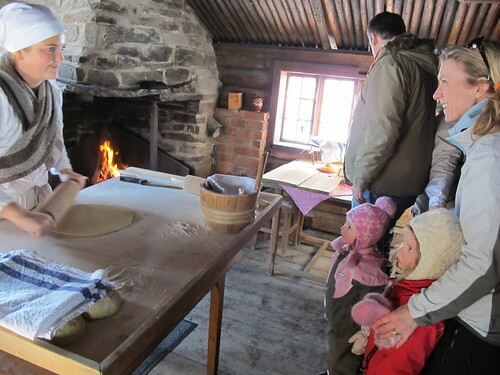 They willingly shared the baking tradition and recipe – Hardanger Lefse: 2 egg, 250 gram sugar, 125 gram melted butter, ½ litre milk, 1 teaspoon of baking powder and 1 kilo flour. This historical museum is enjoyable for the entire family. They plan activities for the children as well, and this was always a popular place when my children were small. They loved to go in and out of these fascinating buildings, they loved to pet the horse drawing the wagon and maybe give him some hay, and they loved the children’s activities. This weekend the theme was fastelaven, or the Sunday before the Easter fast, which the Catholics call Lent. As in Mardi Gras and Carnival, the rich foods like eggs, crème and butter were supposed to be used up so we have a tradition with crème filled sweet rolls. 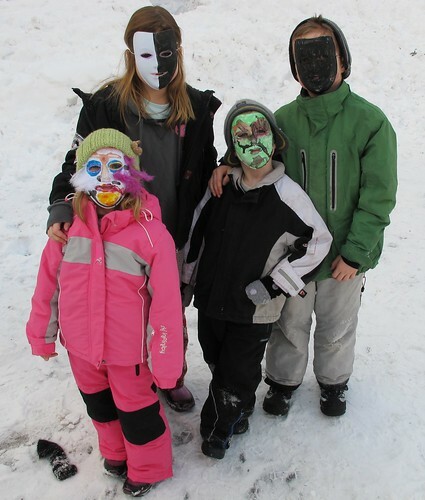 At the museum they had mask making for a kind of Carnival experience which as you can see here the children really enjoyed! There is a lot more to explore and learn about Norway, our culture and history: The permanent exhibits include Folk Art, first half of the Parliament, Norwegian Folk Costumes, toys and more. The Norwegian Evening is an event held here in July and August where music, traditional dance, singing and other activities take place. I hope you will join us sometime – maybe at the Oslo Blog Gathering in August?? This post is part of Reiseblogg2010 – A Norwegian Travel Blog Competition. How fun. How they did things in the old days would be fun to see. Always good to know. Never know when you may need those skills. Oh I love those old buildings! 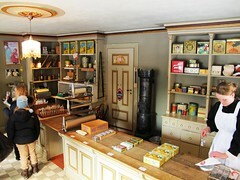 It looks like the Swedish open air museum called Skansen, located in Stockholm. 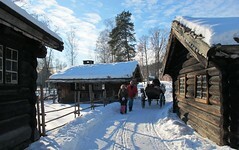 Skansen claims that it is the oldest open air museum in the world! ;-) Wonder who is right? 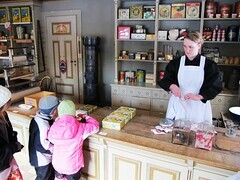 Interesting question and I checked: Skansen says they are established 1891 – 3 years before the Norwegian museum. In 1881 king Oscar II, at that time both Norwegian and Swedish king, started moving in old Norwegian farm buildings to the royal farm at Bygdøy. Folkemuseet became the closest neighbour in 1902. After the break-up of the union between Norway and Sweden in 1905, the old buildings were included in the museum. So, who is the oldest is a matter of opinion, and not too interesting from my point of view. What is more important is that today we cooperate very actively with our museum friends in Stockholm! A wonderful museum! Thanks for providing this – what interesting, historical background! I do agree with you: Both museums are great and it’s good to know you cooperate well! Super bilder Renny. Jeg tror vi vil dra dit neste uke med min mor. Vi var så langt bare i sommer der. I snøen det ser så flott. Hi, Renny. The idea of a large and open-air museum is something new to me. I didn’t hear anything about it yet so I’m sure it doesn’t exist here in our country Philippines. As a big museum, I’m sure it’s a lot of fun visiting the place. What will interest me there is the old architectural styles as well as the seeing the way how people live in the old days. As a photography and history buff, that must be pretty amazing in my part. The Old Town seems to be a photographer’s delight. it it pizza ? look tasty … by the way what kind of is it ? is it russian horse ..
Pizza? When the post is about the Norwegian Lefse! It’s a Norwegian horse: Fjording. this a great report from the Museum which was neighbour to my childhood home. The bread looks like an Indian naan! 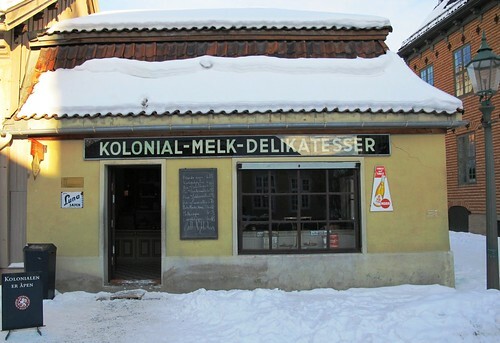 Nice pictures and great visit, learning about Norway one blogpost at the time…! Another very interesting post ! This looks like a lot of fun. Are you watching the winter Olympics? The Nordic countries are very tough in the winter events. Its not surprising. Computer Science The overall design or structure of a computer system, including the hardware and the software required to run it, especially the internal structure of the microprocessor…. What a marvelous place to visit! I would really enjoy to see all the different buildings from all part of Norway and at different periods. Lucky you are with snow! If there was a such museum here it would nice for my little pupils!!! Bise to you and Diane and thanks for the beautiful Valentine’s card! Clarion Collection Hotel Havnekontoret! Mail me for more info. Kindly ck. that bread reminds me of the indian bread! yummm. thanks for the tour. very interesting! That joy of cooking recipe lefse. I vividly remember my visit to the museum, we really liked. But you already know that in Norway we like everything. Actually the outdoor museum is impressive. I remember a building where they made the delicious lefse. Since I set foot on shore Norway I felt very well treated. You know my love for your country. Thanks for making me have such great memories. I’ll have to make some lefse sometime. It doesn’t look hard to make at all. Nice pics Renny, i loved the snow pics a lot and the making of lefse is too good!!! What a beautiful post, Renny! I’ve enjoyed very much to learn a lot about life and culture in your country! How do I find info on a historical dedicated Joseph B. Strauss Golden Gate Bridge architectural drawing I have? When we see the beauty of Marine Drive in Mumbai we talk about the natural beauty of sea and its beach and not how the wall and approach road of the seasore is built. very interesting!! its really good that the government preserved and maintained these kind of establishments!! Looks like a great open air musem- I love those old lofts. I’ve seen something similar in Finland many, many years ago too – as well as in Sweden of course. I wonder what more countries we can see those? Really beautiful and interesting post! Found this through Google images, when I was doing a search for Norwegian farm architecture, as part of some research I’ve been doing. Just wondering, what exactly is meant by “the loft has a gallery on three sides”?